Leah Buechley in corperation with SparkFun released the first version of the LilyPad. It seems to be a great work and I can’t wait till I get one. View the LilyPad guide for more examples. We will order it for EduWear, but unfortunatly it is already sold out. 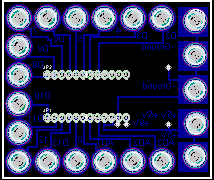 So we will stick to the shield for the Arduino Mini that I verified, until there are new LilyPads availible. That is the Layout in Eagle and here is a pic of the layout.